President Pranab Mukherjee will inaugurate the River festival ‘Namami Brahmaputra’ (Obesiance to Brahmaputra) here tomorrow. 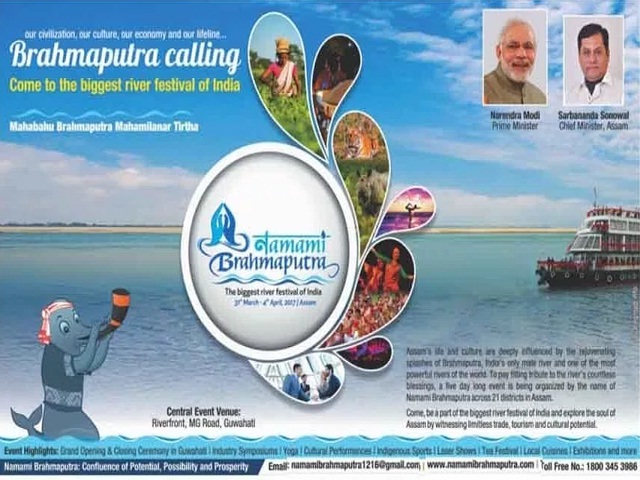 The festival, tagged as ‘India’s largest river festival’ is being organised across 21 districts of the state and will showcase trade, tourism and cultural possibilities of along Brahmaputra river. Nobel Laureate and Tibetan spiritual leader the Dalai Lama, yoga guru Baba Ramdev, union ministers Nitin Gadkari and Mahesh Sharma along with tourists from across the globe are expected to attend the meeting. “This is a perfect opportunity for us to show our cultural strength and economic importance to the world,” Chief Minister Sarbananda Sonowal said. Since time immemorial River Brahmaputra has been a symbol of inspiration and respect for the people of Assam and ‘Namami Brahmaputra’, to be held along the banks of Sadiya in upper Assam to Dhubri in lower Assam is a tribute to this mighty river. Industry and Transport Minister Chandramohan Patowary said so far Brahmaputra has been in news for the devastating effect of its floods but “now we want to showcase its economic potential”. The festival would specifically highlight the potential of the river as an economic lifeline. “Bangladesh and Bhutan along with other countries, have shown keen interest to develop Brahmaputra as a major waterway in the region to increase trade both in the north east as well as other south Asian countries,” he added. The theme song ‘Namami Brahmaputra’ composed by Angaraag Mahanta ‘Papon’ was released in both Hindi and Assamese recently. The Hindi version has Amitabh Bachchan singing the opening lines while the other singers include Shreya Ghoshal, Shankar Mahadevan, Kailash Kher, Sonu Nigam, Arijit Singh, Vishal Dadlani, Shekhar Ravjiani, Shaan, Harshdeep Kaur, Swanand Kirkire, Shubha Mudgal, Usha Uthup and Zubeen Garg. The Assamese version features Papon’s mother and renowned singer Archana Mahanta along with Mridula Das, Zubeen Garg, Pulak Banerjee, Jitul Sonowal, Tarali Sarma, Namita Bhattacharya, Kalpana Patowary, Malabika Bora, members of the Shillong Choir, Mayukh Hazarika, Rupam Bhuyan, Manjyotsna Goswami Mahanta, Nilima Khatun, Santa Uzir and Joi Barua. Papon and Zubeen Garg have sung in both the Assamese and Hindi versions.